Alpine strawberries are, hands-down, my favourite kind of strawberry. They are my favourite variety to eat, and my favourite to grow. These little berries are packed full with flavour… and are adorable. Everything I could want in a berry! Firstly, berries have to be easy for me to grow or it’s just not going to happen. The berries are so small that any sort of exhaustive effort is just not worth it. Fortunately, alpine strawberries are ridiculously well-behaved. They make great container plants. They don’t put out runners like garden strawberries, and stay nicely within their container. Alpine strawberry plants also put up with a certain amount of neglect. I am frequently away for 7-day stretches and can’t water my plants. The strawberries don’t seem to mind the mini droughts at all. I am convinced that my neglect is good for them. Ever notice that strawberries that have been watered a lot taste, well, watery? 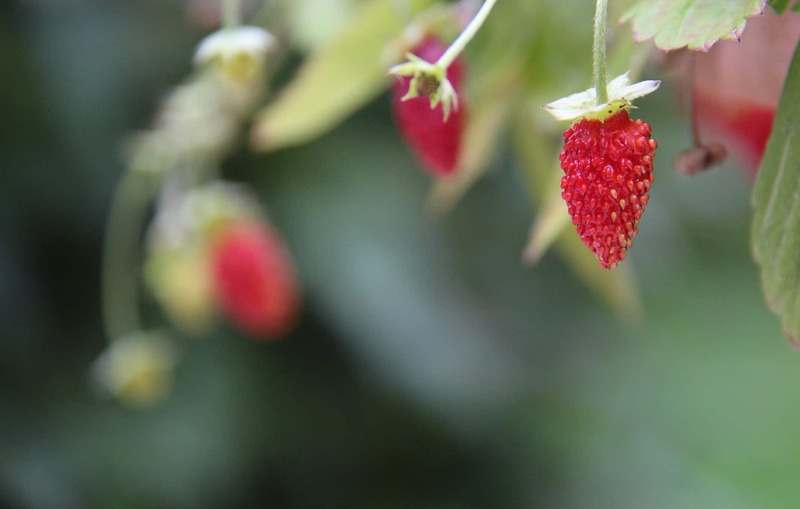 Another excellent characteristic of alpine strawberries is that they will provide fruit from June-September. They will also bear fruit in their first year. And, as mentioned above, they will not send out excessive amounts of runners. This is not a common characteristic of many garden strawberries. But what actually is an alpine strawberry? Alpine strawberries are true heirloom berries. They are not a hybrid variety like most garden strawberries or supermarket strawberries. Alpine strawberries are much smaller than these hybrid types. Check out the photo below for a comparison of conventional garden strawberries to alpine strawberries. The photo above shows a regular hybrid garden strawberry (left) beside an alpine strawberry (right). Both were grown organically in containers on the south-facing side of my house. The hybrid strawberry looks like what we generally see at our farmer’s markets and grocery stores. The alpine strawberry looks like a bit of a runt. Alpine strawberries are herbaceous perennials. This means that the visible parts of the plant will die off as the winter sets in, but will come back up from the roots with new leaves each spring. I love this type of plants because I only have to buy them once! I never buy an annual (one-year) plant when a perennial will do. Perennials may cost more up front, but they will be productive for many future years. I’ve also grown alpine strawberries from seed. Growing strawberries from seed is a bit more tricky than from bare root plants, but is very rewarding. The process is worth it! Plus, there are tons of interesting varieties available as seeds as compared to bare root plants. I like the mignonette and heirloom pineapple alpine strawberries. Like most berries, these strawberries thrive in well-drained soil (sandy, with air voids). They also appreciate rich ground. A mulching of fine compost will do well on top of the soil. You may also wish to place dry straw around the plant to keep weeds down. If you do decide to mulch with straw, ensure there are no seeds in the straw before you use it as a surface mulch. The strawberries will sit nice and dry up on the straw, which will keep them from rotting. Another wonderful feature of alpine strawberries are the wonderful green foliage. The bright green leaves of alpine strawberry plants make wonderful ground cover. I’ve planted the ground around my berry walk with a whole crop of alpine strawberries, and I love it! 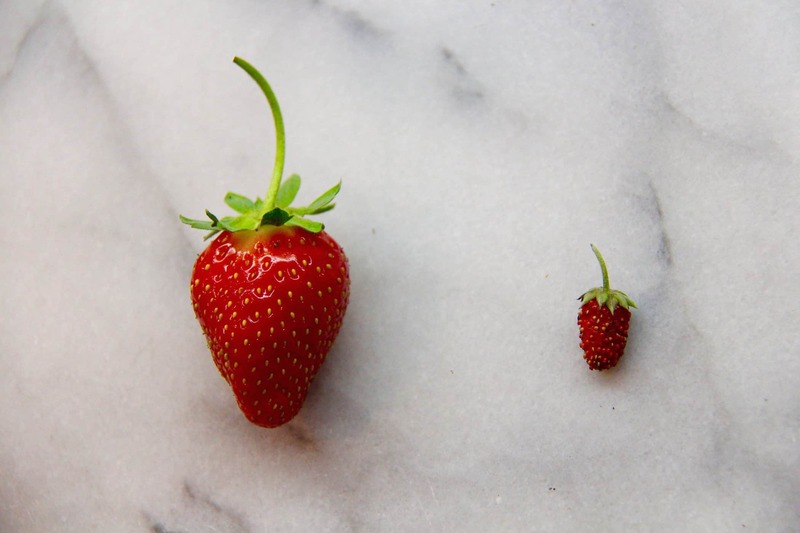 Here’s where it gets fun…the tiny alpine strawberry packs as much flavour as the entire hybrid conventional berry. The flavour of those little guys is incredibly rich. That’s not even the best part. The flavour of the alpine strawberry is not only richer, but is also slightly sweeter in a way I can’t totally describe. It tastes like whatever those marshmallow strawberry penny-candies are trying to taste like. It is magical. Alpine Strawberries are magical. This is the part where I should be suggesting some sort of recipe in which to use alpine strawberries. Unfortunately I am unable as the berries never make it more than a few feet from the plant before I devour them. If I could resist them long enough to use them in the kitchen, I’d likely use them to top a dessert. They would be darling on top of a tart! Trust me, you have to try them (if you haven’t already)! 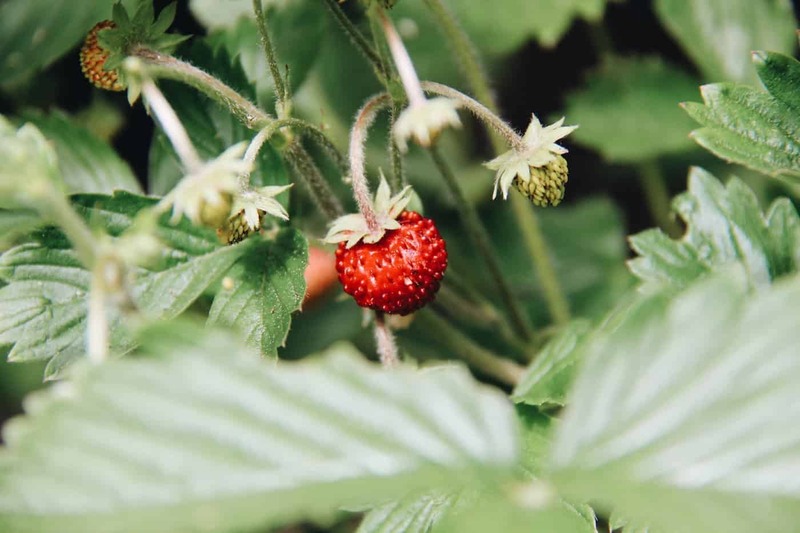 If you’d like to grow alpine strawberries year-round, check out these instructions for growing strawberries in a container. 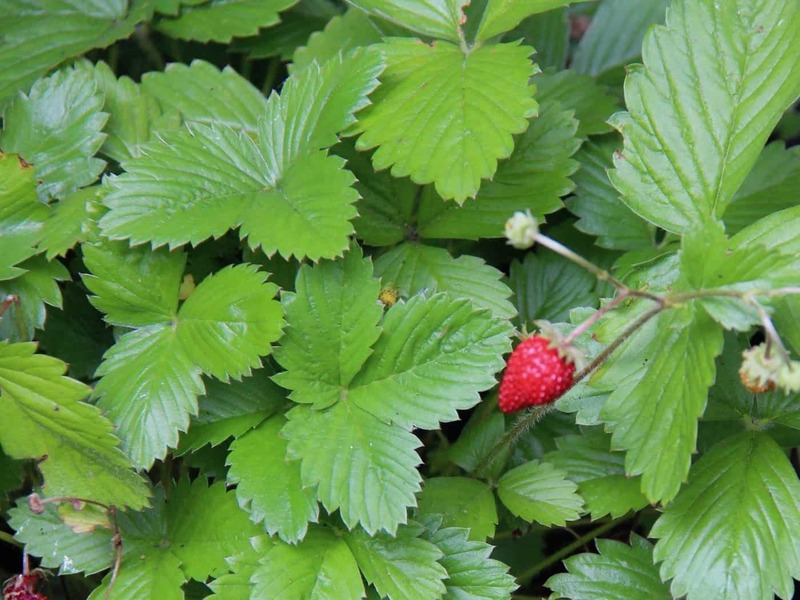 Are you growing Alpine Strawberries? 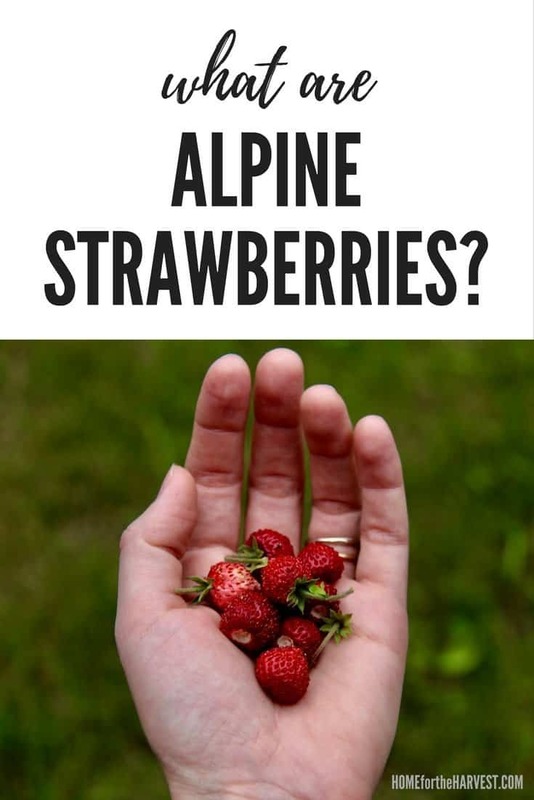 Do you have any favourite alpine strawberry varieties or recipes? Share your favourites and questions in the comments below! While you’re here, grab this free printable about how to grow strawberries indoors, year-round! Totally agree with you regarding the alpine strawberries. I planted a few plants many summers ago and I’m thrilled to find them popping up here and there. Perfect as I my gardening philosophy has always been to being able to walk through the garden and pick loveliness to eat in the moment :-) Beautiful blog and IG account BTW. Looking forward to seeing more. That’s so wonderful that you have had a similar experience! That tiny bit of delicious-ness while walking through the garden is pure heaven. Thank you for the kind feedback on my new blog and instagram. I’ve just checked out your blog and am incredibly inspired! I’m looking forward to learning from you :) I think I’ll start with the scotch bonnet peppers…yummy! I love the yellow alpine ones. I wasn’t crazy about the red alpine taste. They will self-seed. I found them other places in the bed or outside of my bed. However, like you said they are aggressive like regular strawberries. I’ve never seen the yellow ones but will definitely look for them at our local nursery when we move to our new home. With an acre of land I’m sure I can find a spot for these. I’ve eaten the red ones wild up in northern, Ontario in Canada. They were growing right on the rocks near a gravel road. I have to say, they definitely were the best strawberries I’ve ever eaten. We have discovered so many nurseries here in the Finger Lake region of Upstate, NY. I’m sure one of them will have these.